Toronto and Vancouver are two of Canada's largest and fastest-growing city-regions. Between 1991 and 2011, the Greater Toronto and Hamilton Area added nearly 2 million people, while Metro Vancouver added just over 700,000 people. The population of the GTHA grew steadily over the 20-year period, by slightly less than 20% each decade. Metro Vancouver's population increase slowed down over the 20-year period, increasing by 24% in the first decade and 16% in the latter decade (see Table 3). 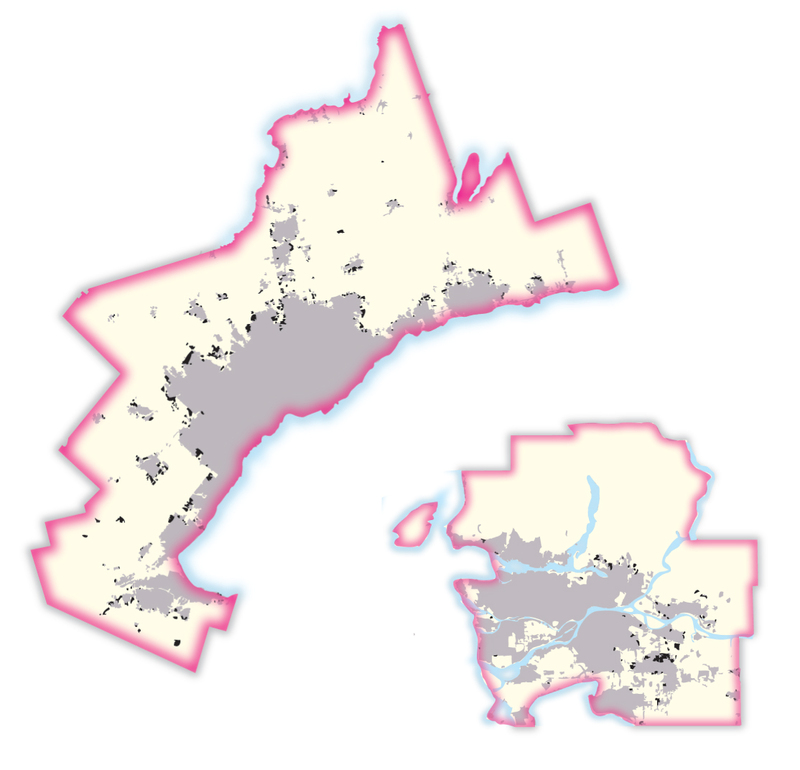 NOTE: The population and dwellings numbers were summed for the geographic area represented by the region boundary. This table includes population and dwellings added in the rural parts of each region, so the totals will not be consistent with those for the "greenfield" and "intensification" areas of each region. In both city-regions, the housing stock grew faster than the population. In the GTHA, the total number of dwellings grew by more than 20% in both decades. Similarly in Metro Vancouver, the increase in dwellings exceeded the growth in population in both decades, although dwelling and population growth slowed during the second decade. In both regions, the gap between the growth in population and dwellings widened in the second decade. These findings are consistent with long-term demographic trends that show the size of Canadian households has been shrinking and the proportion of one-person households has been increasing (CBC News 2012; Statistics Canada 2013). One of the most interesting findings in our analysis is the change in the rate of urban expansion between the two decades. While population and dwellings have continued to grow, the rate at which formerly rural land is being urbanized through greenfield development has decreased over time. The results of Metro Vancouver's long-standing approach to urban containment are evident in the findings. The urbanized area of the region increased by 16% between 1991 and 2001, and by a mere 4% between 2001 and 2011. In the GTHA, although the increase in urban area was 26% between 1991 and 2001, outward expansion slowed down dramatically, to 10%, in the second decade of the analysis, while the increase in population and dwelling numbers maintained a steady pace. The slowdown in urban expansion in both the GTHA and Metro Vancouver between 2001 and 2011 seems to be part of a trend in fast-growing Canadian cities, as Calgary and Edmonton also slowed their rate of urban expansion and grew more densely at the urban edge. One definition of urban sprawl is that the increase in urban expansion is greater than the increase in population (Fulton et al. 2001). By this measure, Metro Vancouver cannot be characterized as sprawling during this two-decade period, while the GTHA shows patterns of sprawl in the first decade, but not in the most recent decade. Both regions' slowdown in urban expansion seems to be part of a trend in fast-growing Canadian cities, as both Calgary and Edmonton also exhibited patterns of sprawl in the 1990s, but not in the first decade of the new millennium (Neptis 2014; Taylor, Burchfield and Kramer 2014) These trends point to higher densities in the construction of residential dwellings at the edges of cities compared with the greenfield development of previous decades. While both Toronto and Vancouver regions strive to achieve a compact form, our findings show that the approaches taken to achieve that goal differ. In Figure 5, we compare the proportion of dwellings constructed through greenfield development versus intensification. In Metro Vancouver, the vast majority of dwelling construction was directed to the existing urban area, resulting in an intensification rate of 80% in first decade and 75% in second decade. In the GTHA there has been a more even split, with a small majority of dwellings constructed through greenfield development in both decades. The composition of the housing stock in each region also differs when we compare proportions in 1991, 2001, and 2011 (see Figure 6). In Metro Vancouver, the housing stock has been transformed from one dominated by single detached homes to a more balanced stock over a 20-year period. In 2011, Metro Vancouver exhibits a more evenly distributed proportion of housing types compared with the GTHA's marked split between single-detached houses and high-rise apartments. What is remarkable is that in Metro Vancouver, the housing stock has been transformed from one dominated by single-detached homes to a more balanced stock over a 20-year period, while the GTHA's housing stock changed very little over that same period, even though the rate of dwelling growth remained steady in the Toronto region while it declined in the Vancouver region. These differences may be attributed to differences in zoning, land use policy, consumer preferences, and market demand. Our regional findings suggest that as the Toronto region continued to add people and dwellings at a pace similar to that of the previous decade, this growth is taking up less space than it did in previous decades, although the proportions of the different types of housing stock remained largely the same over the 20-year period. Metro Vancouver's growth in population and dwellings slowed after the 1990s, and the growth of its urban footprint also slowed while at the same time the region was able to transform its housing stock to ensure a greater balance of different types than was achieved in the Toronto region over that same period. Metro Vancouver continues to accommodate the majority of its growth through intensification, while the GTHA's development leans more towards greenfield development. In the remaining sections of the paper, we focus our analysis on subregional patterns that emerged in the first decade of the 21st century--what is happening at the edges of these two city-regions and within the existing urban area. Are new residents and dwellings clustering in urban centres or near accessible transit service? Which municipalities contributed most to growth through greenfield development and intensification? "5 or more storeys" refers to a building with more than four storeys. Statistics Canada does not differentiate between buildings of over 5 storeys, although in general, a building of 5 to 8 storeys is considered a midrise, rather than highrise, building. Note that the apartments category includes both rental and condominiums.